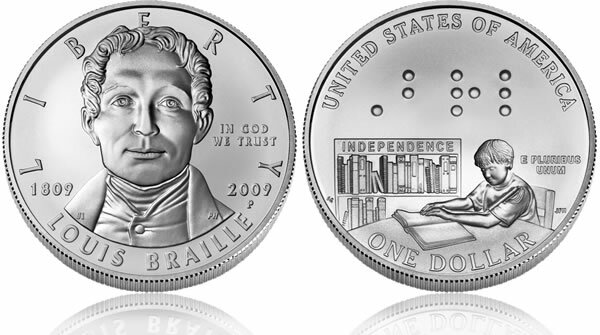 2009 Braille Silver Dollars celebrate the bicentennial birth of Louis Braille, who is most remembered for inventing the Braille system for reading and writing by the blind and visually impaired. On March 26, the United States Mint began issuing the up to 400,000 proof and uncirculated silver coins bearing the image of Braille on the obverse (heads side). The reverse or tails side of the silver dollars depict a child reading a book in Braille and includes the word Braille (abbreviated "BRL" in Braille code) depicted in the upper field. The US Mint first released the Braille designs and a prototype in July 2008 during the National Federation of the Blind (NFB) annual convention in Dallas, Texas. 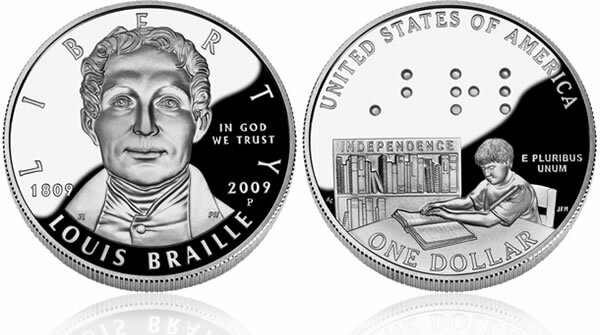 "The United States Mint is proud to present the 2009 Louis Braille Bicentennial Silver Dollar coin design. It will be the first coin ever minted in the history of our country to contain readable Braille characters," US Mint Director Moy said when the designs were first revealed. In the silver coin launch ceremony held at the NBF Headquarters in Baltimore, Maryland, Mr. Moy again emphasized its significance. "For the first time in history, the United States has a coin with readable Braille. 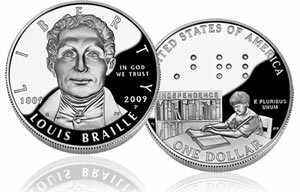 The 2009 Louis Braille Bicentennial Silver Dollar honors the developer of Braille, a tactile code that has been instrumental in the literacy and independence of the world’s blind people." Three other coins — the Alabama state quarter and the 1995 and 1996 Paralympic Silver Dollars — also included Braille, but were too small to be read by the visually impaired. 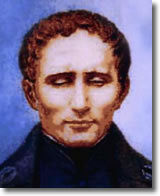 Louis Braille (January 4, 1809 – January 6, 1852) lost his sight at the age of three after accidentally injuring himself with an awl in the shop of his father Rene, a maker of harnesses and other objects of leather. A youth who was both intelligent and creative and was blessed with dedicated parents, a thoughtful local priest and an energetic local schoolteacher, Braille adapted to the situation and attended local school with other youths of his age, an unheard-of practice for a blind child of the period. was given a scholarship by a local nobleman and went to Paris to attend the Royal Institute for Blind Children where he became the youngest pupil. At the school, most instruction was oral but Braille found there were books for the blind—large, expensive to produce books in which the text was of large letters embossed upon the page. Soon Braille had read all 14 books in the school, but thirsted for more. A captain in Napoleon’s army, Charles Barbier de la Serre, had invented "night writing," a method for communicating on the battlefield amidst the thick smoke of combat or at night without lighting a match. It used dots and dashes that were felt and interpreted with the fingers, and later adapted the method for use by the blind, calling it Sonography because it represented words by sounds, rather than spelling. Braille adopted the Sonography method instantly but soon recognized that the basis in sound and the large number of dots—as many as 12—used to represent words was too cumbersome. By the age of 15, and using a blunt awl, the same sort of tool that had blinded him, Braille had developed what is essentially modern Braille, a code that uses no more than 6 dots in a "cell" of 2 columns of 3 dots each to represent each letter and contains a system of punctuation and of "contractions" to speed writing and reading. In contrast to the bulky books consisting of large embossed letters, Braille books can contain as many as 1000 characters or contractions on a standard 11-by-12-inch page of heavy paper, and to this day Braille can be punched with an awl-like "stylus" into paper held in a metal "slate" that is very similar to the ones that Louis Braille adapted from Barbier’s original "night writing" devices. Also a talented organist who supported himself by giving concerts, Braille went on to develop the Braille representation of music and in 1829 published the first-ever Braille book, a manual about how to read and write music. 8 years later, in 1837, Braille followed that publication with another book detailing a system of representation of mathematics. Braille’s talents were quickly recognized, and at 17 he was made the first blind apprentice teacher at the school, where he taught algebra, grammar, music, and geography.He and two blind classmates, his friends who probably were the first people to learn to read and write Braille, later became the first three blind full professors at the school. However, despite the fact that many blind people enthusiastically adopted the system of writing and reading, there was great skepticism among sighted people about the real usefulness of Braille’s code, and even at the Royal Institute, it was not taught until after his death on January 6, 1852. The above excerpts were taken from the Louis Braille Bicentennial Braille Literacy Commemorative Coin Act, which was the coin legislation that became law (Public Law 109-247) on July 2006 and authorized the silver coins. *A special set containing an uncirculated coin is expected to be available later this year. Mintage of the set is set to 25,000 coins. The US Mint also accepts orders at 1-800-USA-MINT (872-6468). Hearing- and speech-impaired customers may order by calling 1-888-321-MINT (6468). Surcharges from the sale of each coin are authorized to be paid to the National Federation of the Blind to further its programs to promote Braille literacy. why do they not say what the braille inscription on the reverse side means?? ?